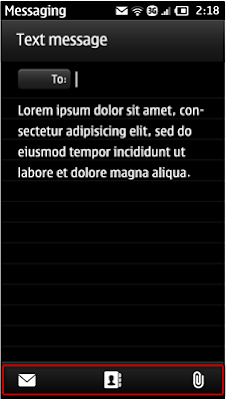 Some screenshots from Symbian Belle / PR3.0 on the E7. We thought that might have been any old PR3.0 screenshot pasted on a E7. However, another tweet shows the images below. 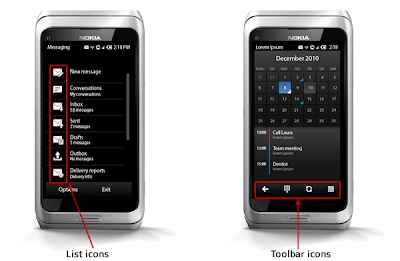 The thing they’ve highlighted “list icons” isn’t new. That’s always been there. Although We don’t know what else is in messaging as it seems you can scroll down ( you can’t on S^3, those are the available options). The change of font is certainly welcome. 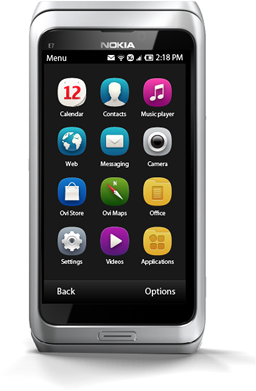 Even Symbian Anna demoes seem to be stuck on Nokia Sans. Note the top shows the app title and the new all encompassing, space saving status bar. You’ll note the consistent appearance of the status bar (clock/signal everywhere) as well as the bottom toolbar of back, dialer? refresh and options. Why is there a refresh button in calendar, We don’t know. Perhaps to sync? What We find confusing is why the toolbar at the bottom isn’t consistent. The one on the right should persist most often. Perhaps it could minimize itself WP7 style.